Laminitis used to be considered a condition suffered most typically by overweight ponies after gorging themselves on spring grass, but we now know there are a wide range of other causes. Research has identified that horses of all sizes and shapes suffering from metabolic conditions, such as Cushing’s disease, are also common sufferers of laminitis. Concussion can also be a cause so competition horses working on hard ground can be susceptible and steroid treatment for other conditions can also lead to a horse suffering an unexpected bout. 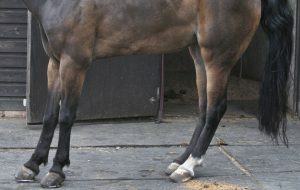 In a case of laminitis, the laminae (the soft tissue structures which attach the pedal bone to the hoof wall) become inflammed causing pain and leading to the horse taking up the typical laminitis stance (pictured). The inflammation results in the laminae being unable to support the pedal bone, which eventually rotates within the hoof capsule. Most typically both front hooves are involved, although in some cases laminitis can be found in all four legs. In cases where laminitis occurs due to excess weight being placed on a single one leg (when the other leg is seriously injured and in a cast for example) then just a single foot can suffer. A horse suffering from acute laminitis will be reluctant to move and may lie down to try and reduce the pain. Once down it will be extremely reluctant to get to its feet. When standing it will stretch its forelegs out in front, carrying its weight on its heels. The hind legs will be well under the body and it may shift its weight from side to side. If you suspect laminitis, seek veterinary advice immediately. Prompt diagnosis and the correct treatment, combined with careful ongoing management and shoeing, can make the difference between a speedy resolution with a return to full work and irreversible foot changes. H&H question of the week: laminitis scare – what should I do? H&H Feed Week: The truth about sugar — should we really fear it?